Snippets of Jack: "Now You're Not Making Any Sense At All"
"Now You're Not Making Any Sense At All"
Jack: "Gentlemen, what do keys do?" 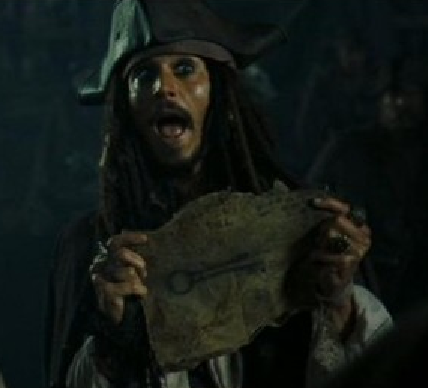 Gibbs: "And whatever this key unlocks, inside there is something valuable. So we're setting out to find whatever it is this key unlocks?" Jack: "No! We don't have the key. WE can't open whatever it is that we don't have that it unlocks. SO what purpose would we be serving finding whatever need be unlock, which we don't have. Without first having found the key what unlocks it?" Gibbs: "So we're going after this key." Jack: "You're not making any sense at all." As you can tell from this conversation, Gibbs has definately lost his marbles. I mean, he's rambleing on and on about things that no one ever understands. Don't we all feel bad for Jack who has to listen to this gibberish man talk about things that clearly do not make any sense and then has to follow out his orders? Oh wait, that's Gibbs. Well, we don't mind Jack talking nonsense without end, do we? Because that's just Captain Jack Sparrow, savy?